By holding the record for the UK’s longest running children’s TV show, Sooty and his friend Sweep have endeared themselves to millions of kids over many generations. The first programme was aired in 1955 when he was often joined by friends including Soo, Cokey, Mr.Fusspot, Scampi and PC Nab. 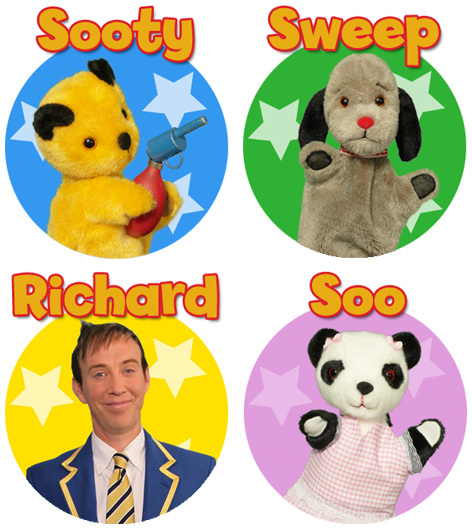 Several toy suppliers have held the licence to make Sooty and Sweep soft toys and puppets, with the best known probably being Golden Bear. German soft toy company Steiff have even got in on the act with their delightful ‘button in ear’ version holding the inevitable magic wand. Such is the continuing popularity of the Sooty show, parents can even buy knitting patterns to create their own versions. DVDs, books, party goodie bags and annuals are just a small part of the Sooty and Sweep merchandise that’s on offer to fans of the show. Originally created by Harry Corbett, his son Matthew took over the Sooty show in 1976. He in turn retired in 1998 and handed over the reins to Richard Cadell who was an existing co-presenter. Who can forget the catch phrase "Izzy wizzy, let's get busy!” that features in almost every programme. With no sign of modern kids rejecting this character that was created so long ago, it seems pretty certain that Sooty and Sweep toys will be around forever. Golden Bear was confirmed as the master licence holder for a brand new range of Sooty, Sweep and Soo toys. With their usual expert design and manufacturing techniques, they produced a gorgeous selection of huggable plush toys, many of which feature popular phrases from the show. Kids can also collect some smaller vinyl figurines of all the show's characters, as well as a selection of Sooty playsets.